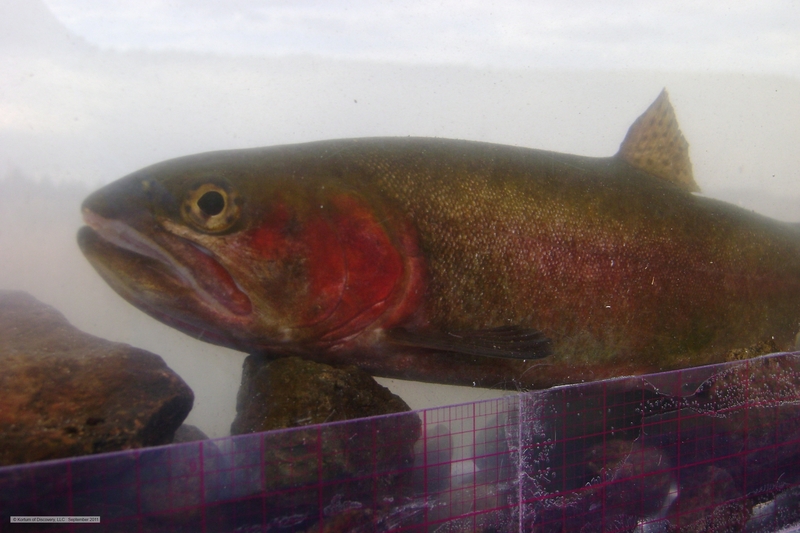 We all know that risk is involved in an effort to propagate a completely wild strain of cutthroat trout into a population that could be utilized to restore a phenotypical representation of an extinct strain of trout. 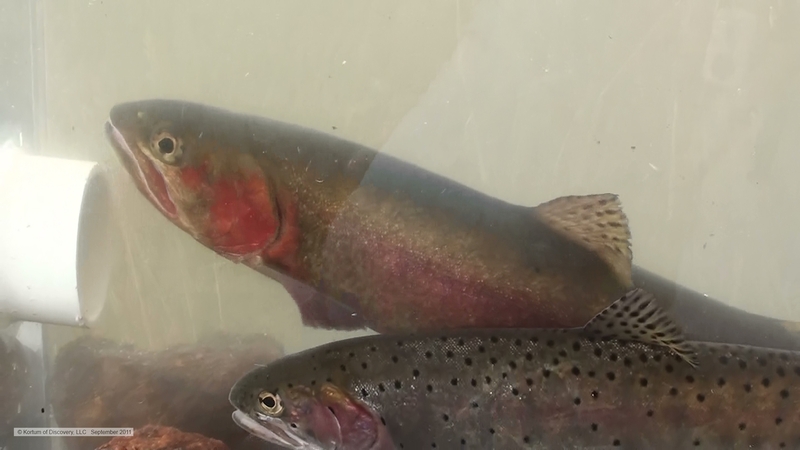 Yet positive reports from the former ODFW Fish Biologist for SE Oregon, and encouraging remarks from personnel at the hatchery, indicated that everything was on track to be a “miracle” of the 21st Century where the Alvord cutthroat trout was concerned. 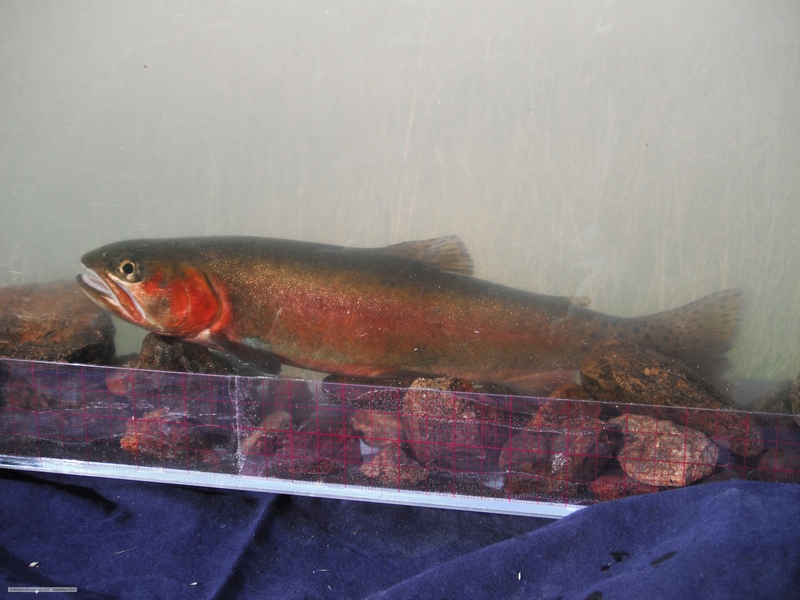 For months, I and those who have been inquiring regarding the state of the trout at Fort Klamath Hatchery have been anticipating the news of a selected location for the release of the trout, and the implementation of the very last phase of this project—the actual release of phenotypical Alvord cutthroat trout back into the wild. Realistically, with horrible drought conditions affecting California and nearby States – this “rescue” seemed to be poised to take place just in the nick of time. As much as this author appreciates the surrogate home stream for these trout: drought conditions have exacted an extreme toll even on this refugium. 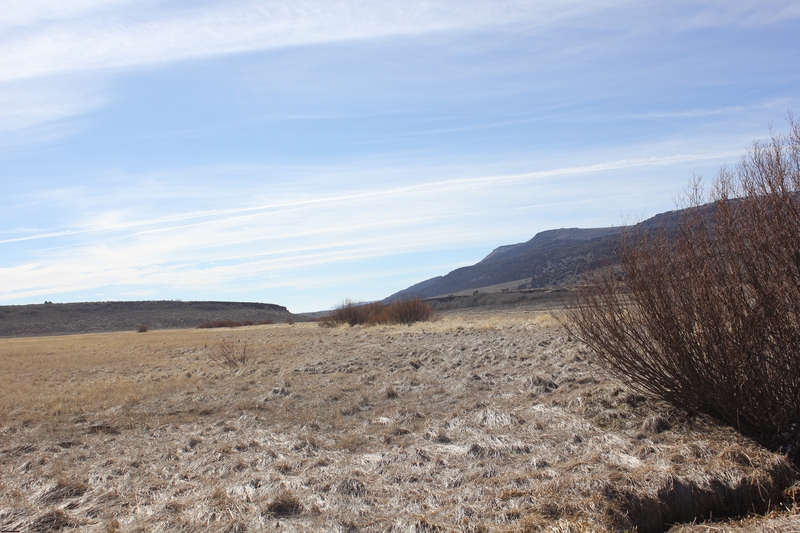 In the dead of this past winter, we drove right up to the meadows. Passes that would normally be a snowy, icy, risk to drive in winter – were like a late-summer August cruise. Mid-February the stream was at late summer water levels – with ice-rings showing the stream had already dropped several inches during the winter . . . and again . . . no snow on the nearby mountains for snow melt to bring the water levels up come spring. This author would not consider good news what rain has fallen since. It now seems so clear – that spring flooding is essential to “cleanse” this little system. 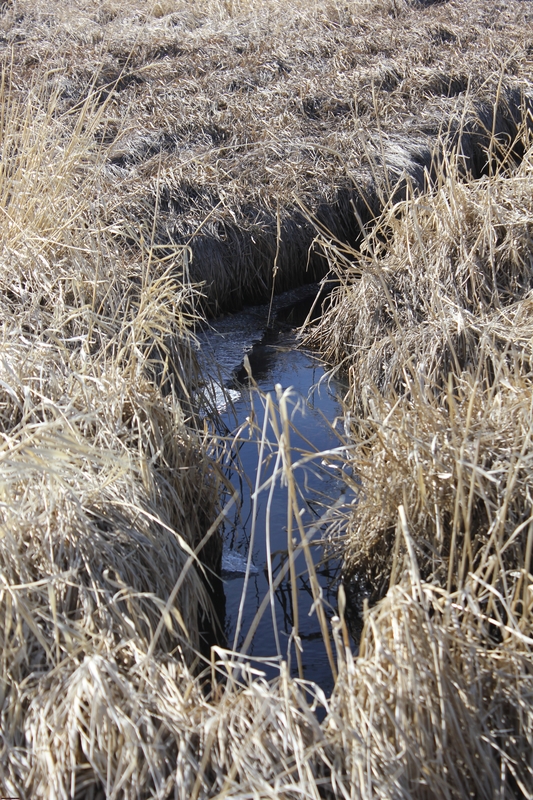 The bottom of the creek throughout the meadow was covered with silt . . . The pockets and pools that I’ve seen sport gravel – and trout – were still and sullen with dark grey sludge of sediment . . . that hasn’t been cleansed for years now. As I walked the distance of this still slow trickle, I realized that what has been missing the last few years has been the swell of the system in the spring with a strong flow to carry the silt and sediment down to the marsh. To create gravel beds of small smooth rocks, segments for diverse insect production, and ideal trout habitat. It was alarming to realize that there were still sections of streamside habitat with the charred remains of the grass and brush burns from two autumns ago. 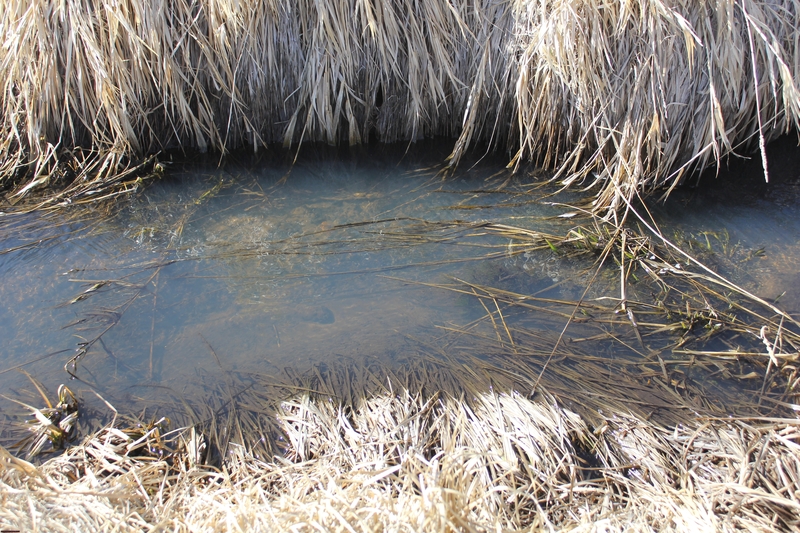 The thought of this system still being a refugium for the legacy of Alvord trout seemed to dissolve this winter — with the realization that this drought surely is worse than the 1934 drought that put many of this region’s ranchers out of business. 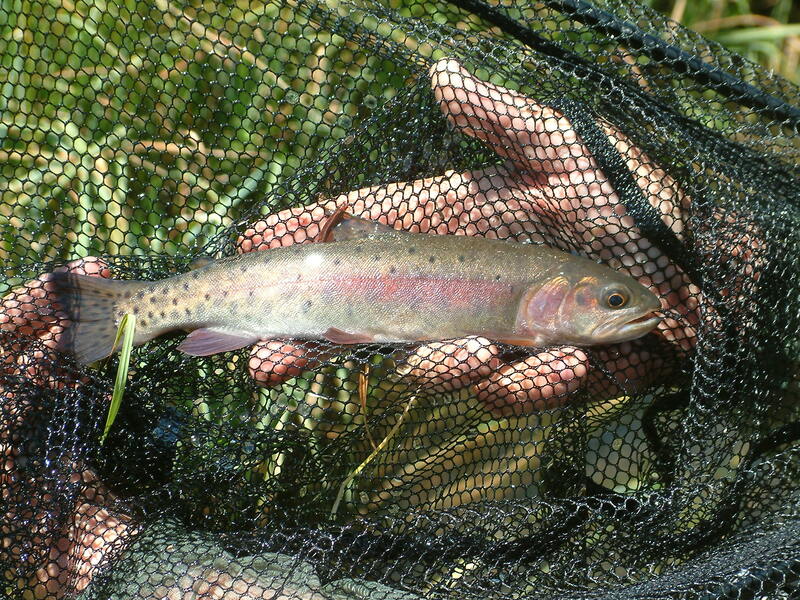 The Alvord cutthroat trout that were moved to this small creek were not then fighting the extreme burden of hybridization with other cutts that they now have been for decades. The chemistry of the system has certainly not been as hospitable to rainbow or redband strains as it has been to cutthroat trout. Certain trout did survive the drought of the 30’s – but I wish that this author had more confidence for 2015 . . .
No snow was visible in the southern range of the mountains in February. This site has previously recorded our experience – that we’d estimated the ratio of respectable Alvord phenotypes in the system to be approximately 1:20 i.e. 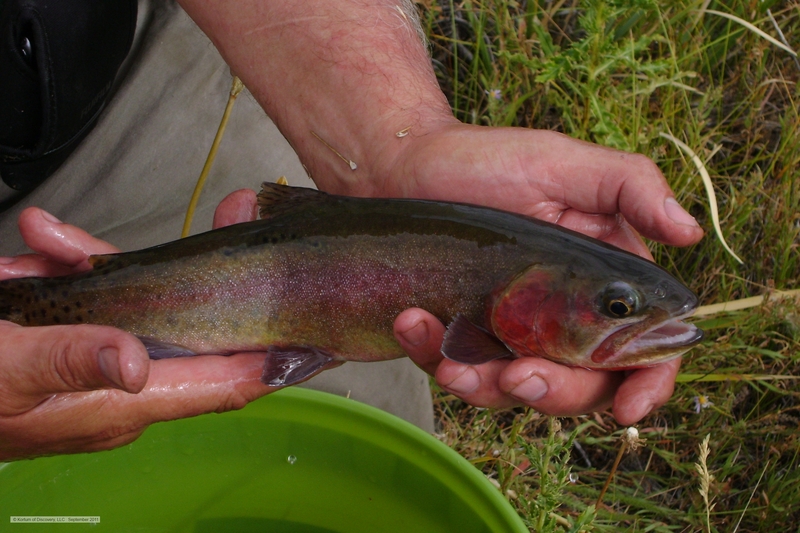 of 20 trout, just one would be likely to be a reputable phenotypical expression of the original characteristics of the Alvord cutthroat trout. One can always hope that the extreme conditions the stream is experiencing now will actually naturally “cull” the non-desert trout that struggle with such low-oxygen and alkaline conditions. Yet the situation seems too dire to even hope against hope . . .
We’ve seen that the characteristics — primarily the spotting pattern, and secondarily the unique coloration, certainly appears to be more dominant in the males. Females expressing Alvord characteristics have been quite rare. This was evident when ODFW did capture thirteen phenotypes in 2013. One was a female. This brings the ratio for finding female Alvord phenotypes to a horribly stark unlikelihood. The math indicates great difficulty here, especially after extreme dye-off of summer 2014. 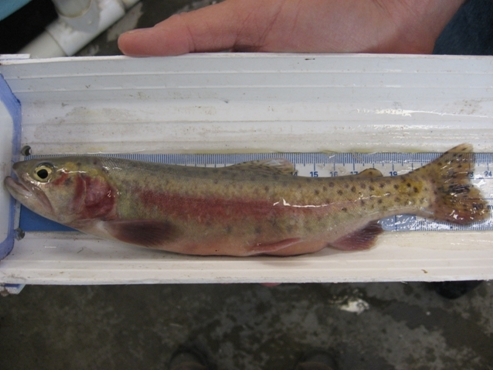 Female Alvord Phenotype used for Hatchery Spawning in Spring 2013 . . .
Add to the above the fact that the initial foray into the system to electroshock in 2013 did not yield any Alvord phenotypes. We were asked where we would suggest would be a good place find Alvord phenotypes . . . There is a section where we had noted amplified presence and spring activity in the early season, so we provided GPS coordinates and a map of this stretch of the stream that we hoped would yield spawning phenotypical Alvord trout. We were told that there was no difficulty in finding Alvord phenotypes in this stretch of the system. But the tragic bitter reality is – this stretch of the stream dried up last year. One can only reflect that the only remaining water flow was near the headwaters, and perhaps some acrid water in the reeds of the marsh. 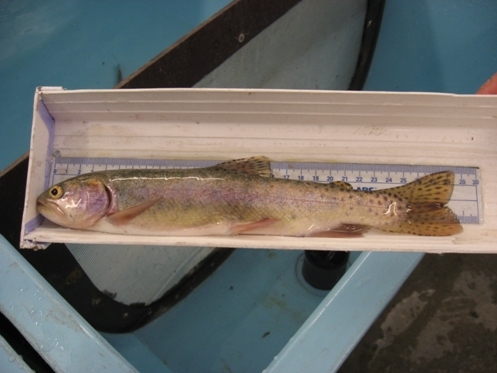 Yet the real crux of the situation has less to do with the drought, and difficult conditions in the region, and more to do with decisions ODFW has made with respect to the Alvord cutthroat trout phenotype project. 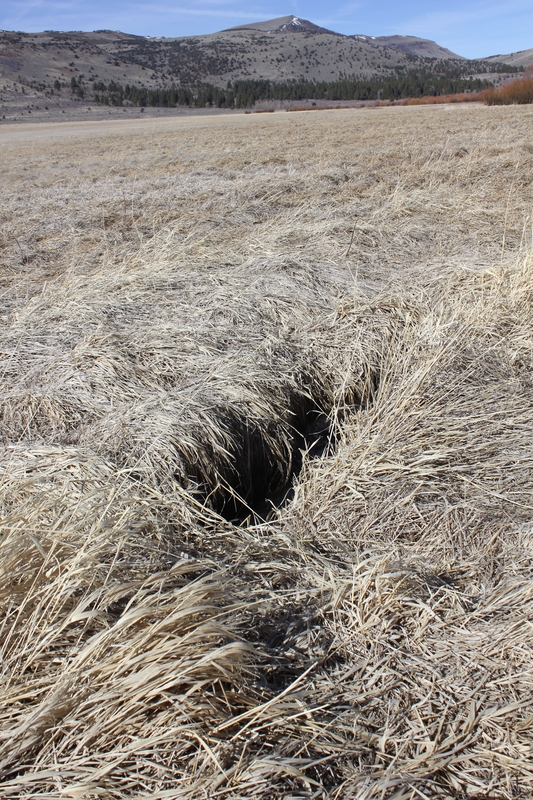 Though I was already quite depressed with the extreme drought situation in the region, and was a bit apprehensive while seeking a response from ODFW, nothing could have prepared me for what I was told when I finally got the SE Oregon fish biologist on the phone on April 8th. A comment was made that with water conditions being such as they are that there wasn’t really a good choice for a(n) (uninhabited) stream release . . . And, a comment was made that the hatchery needed more space for existing trout on their agenda . . . So, I was told that the trout had been released into Willow Valley Reservoir – in extreme Southern Oregon – near the California border. I can’t express the stunned numbness I felt. Willow Valley Reservoir is primarily a Largemouth Bass fishery (16 inch minimum length). Generally turbid and murky water. When I asked the biologist if the trout had any stream or resource there to self-propagate, he told me that he didn’t know. A thought that crossed my mind, was that perhaps ODFW had released the trout in a stream that they did not want anglers or enthusiasts to know about; and so a story was created to throw anglers off — and keep the site a secret. But the more we looked into this, the more personnel we spoke with, the story was consistent; with more detail being added after numerous questions had been asked. Comments made from other biologists / personnel familiar with the situation were that the offspring from the phenotypical parents did not express Alvord characteristics (as their parents had). 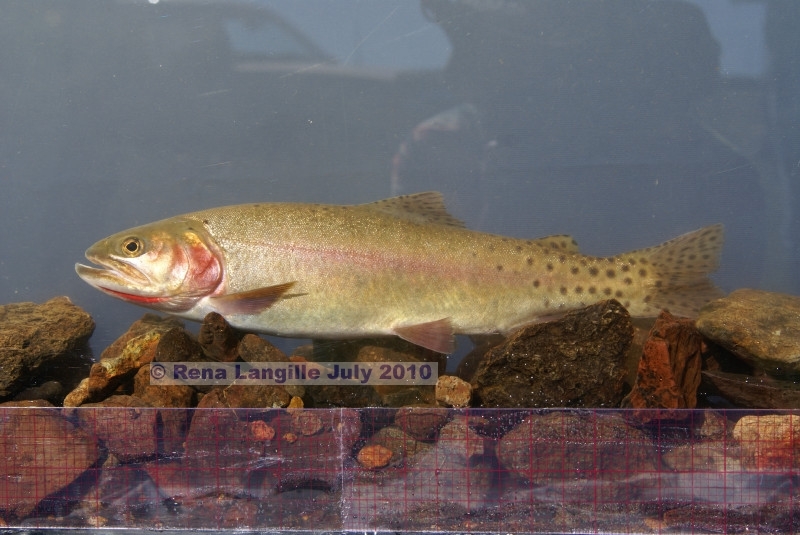 In fact, it was concluded that the trout expressed rainbow characteristics from “stock #53,” which evidently matches the rainbow stock that was inserted into ***** creek in the 50’s and 60’s . 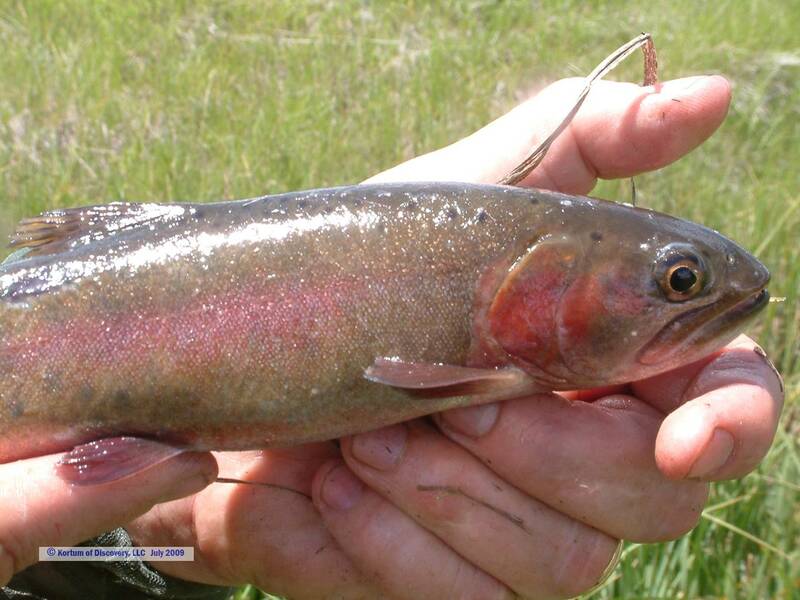 . . along with Lahontan cutthroat trout introduced at that time. We were told that “square spots on the tale” are a telltale (no pun intended) characteristic of this ODFW hatchery stock. After asking around, we were told that the hatchery had taken some pictures of the trout, and sent them to the biologist for SE Oregon. Upon asking, he agreed to send some pictures to us. It is generally true that the pictures sent do us did not show vivid Alvord characteristics. If I were catching them in the stream, I would not have immediately thought of them as striking alvordensis representatives. However, that initial perception may beg the questions that should have been asked, and the background that should have been considered; that might have yielded a more complete decision making process – and a different conclusion. As we have noted in the past on the website; there is geological proof that Lake Alvord overflowed into the Snake/Columbia Basin for a prolonged period of time (even prolonged in geological terms). 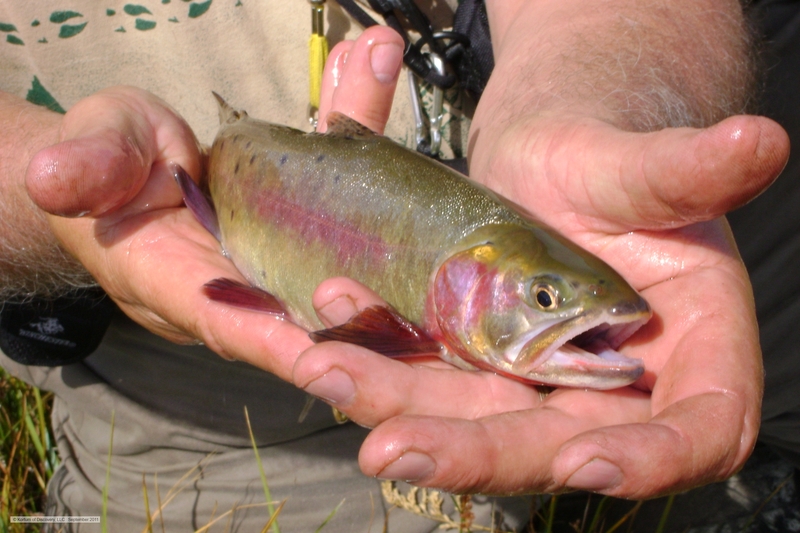 We have also noted that Dr. Behnke asserted that the lower Snake and Columbia Systems were once dominated by Yellowstone cutthroat trout, but these were displaced by Ocean-run Rainbows over time (thus, the Yellowstone cutthroat trout now only dominate down to Shoshoni Falls in Idaho). 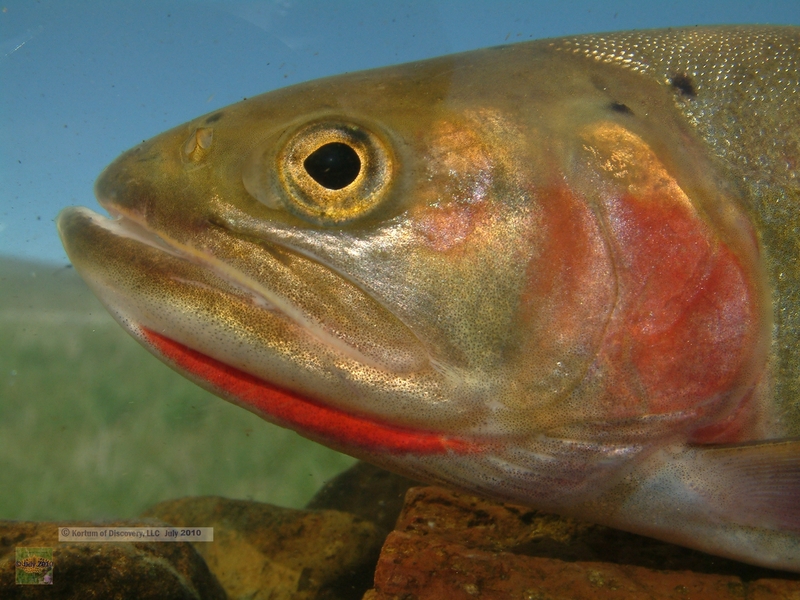 A biologist in Oregon might not be familiar with Yellowstone cutthroat trout; but it should be noted that Yellowstone cutthroat trout have been known to exhibit a-symmetrical (not circular) spotting, especially on the caudal peduncle and on the tail. 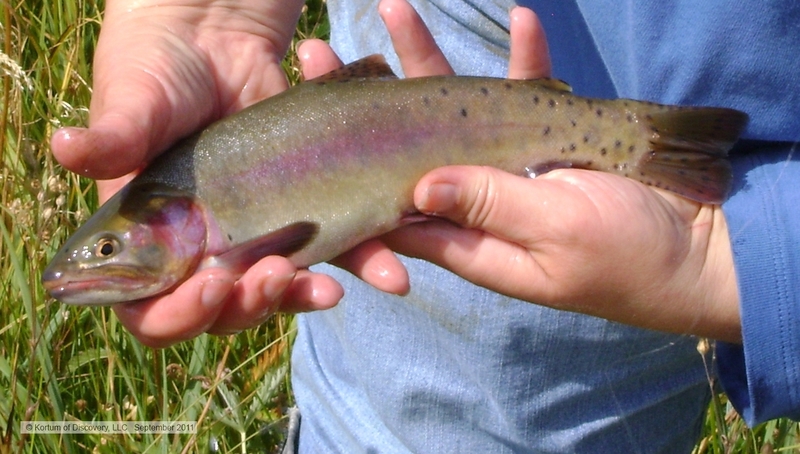 It certainly is noteworthy to mention, that in multiple sampling efforts over many years, including the 2008 sampling and a 2010 Sampling by the US National Wildlife Service, no discernible rainbows were identified -of hundreds of trout- all were visibly cutthroat trout. No Redbands found by ODFW in ***** Creek. 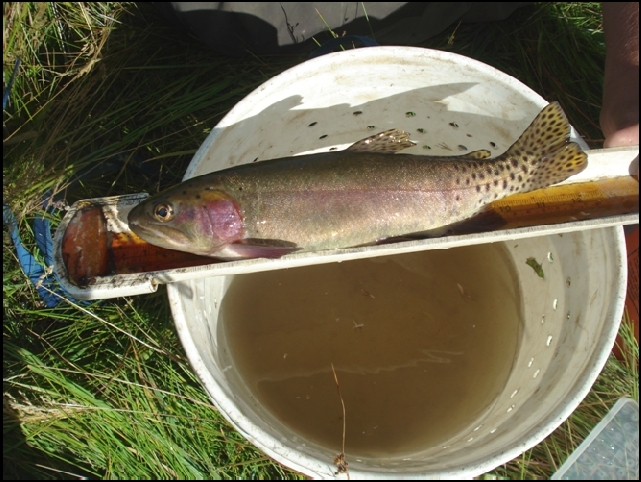 This was one of the factors that caused Dr. Behnke to conclude during the sampling foray in 2006 that there had to have been a well established cutthroat population in this stream, in order for redband/rainbow trout to have not hybridized and dominated this population. The previous biologist for SE Oregon had stated that (at least) 30 of the then surviving progeny showed the correct spotting pattern for Alvord phenotypes – spots above the lateral line, except on the caudal peduncle and the tail fin. 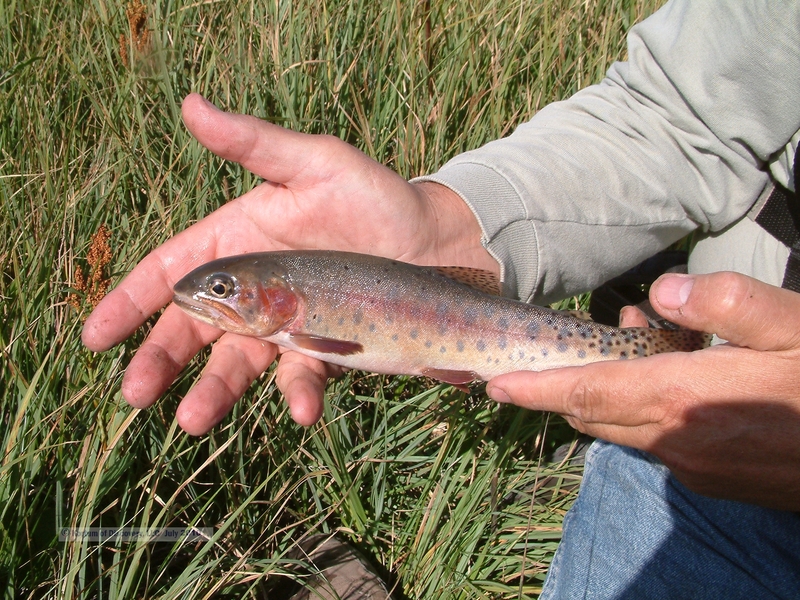 Patrick Trotter (Cutthroat – Native Trout of the West) was insistent that the spotting pattern was the core constituent to look for to identify the Alvord phenotype . . . that coloration would be affected by environment and diet, etc. 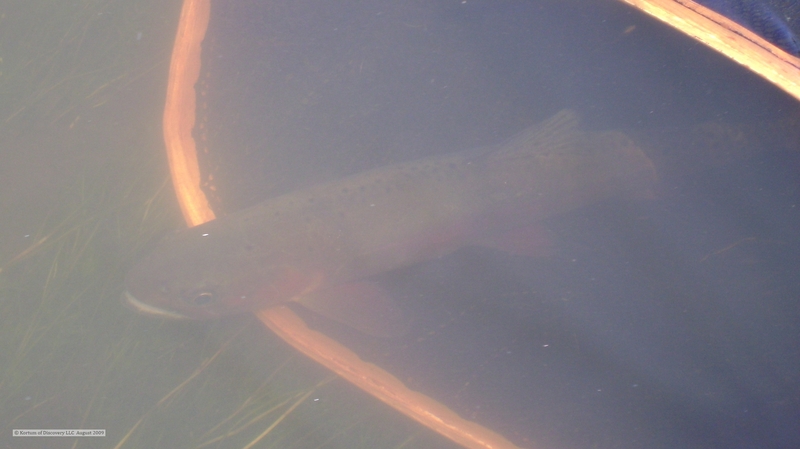 Even in the stream, we have found that the classic Alvord coloration becomes evident in the mature trout. 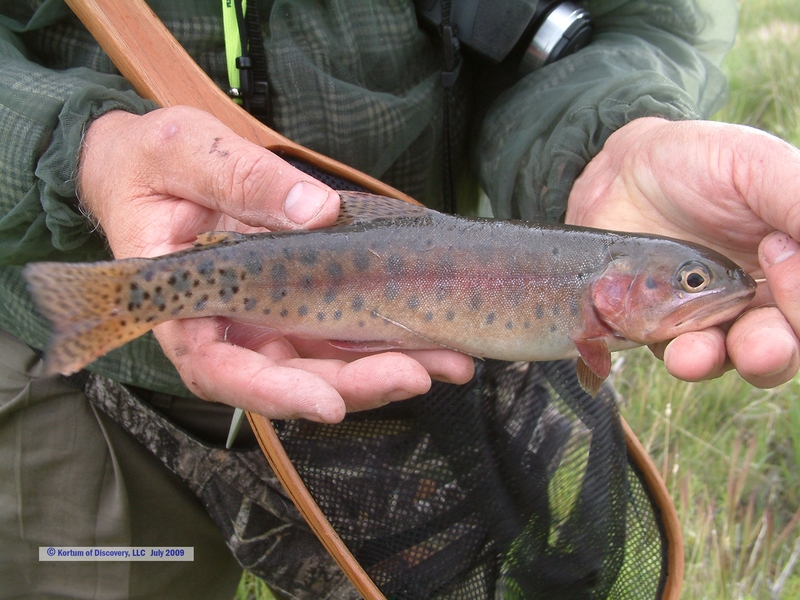 Having caught the same trout over several years, the coloration change from early adulthood into full maturity was remarkably striking. 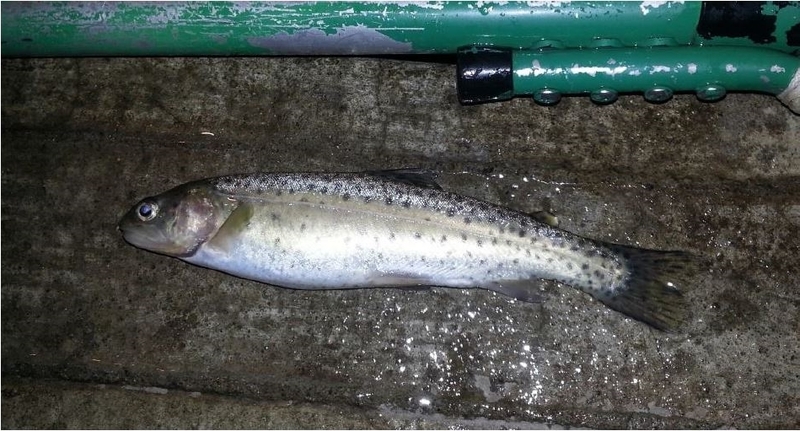 Though the color of these hatchery trout is an appalling silver, this most likely is a result of the hatchery environment and the diet provided to these fledgling trout . . .
One might ask how parentage of a certain phenotype could yield offspring so differentiated from their parents. 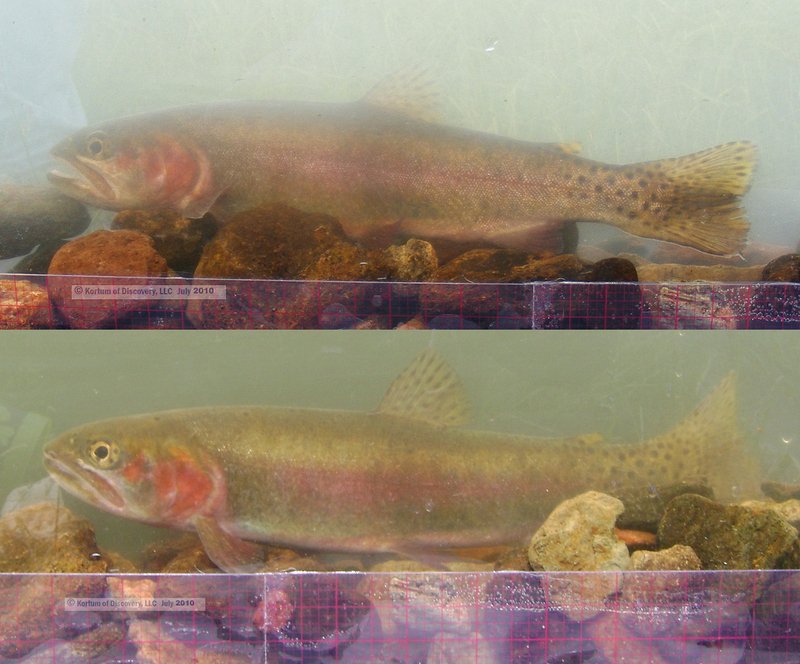 Yet, comparing pictures of the primary and secondary males that were spawned with the singular female in 2013, it seems there is still similarity in these trout. Of the dozen photos ODFW shared with us, some showed spotting in front of the caudal peduncle, below the lateral line. But then, that would be expected. The cutt marks seem muted in these photos; yet oval parr marks are deemed to be cutthroat characteristics. 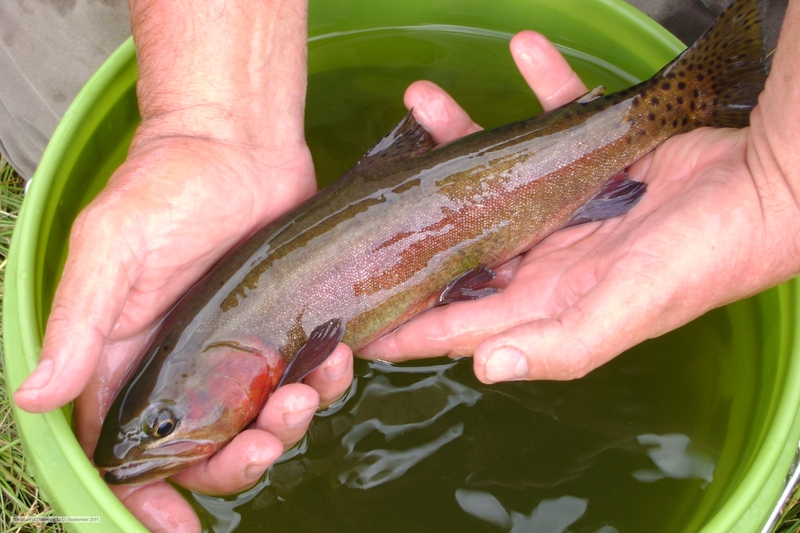 When the State of California began to mitigate for hybridization that occurred within the Silver Creek Paiute cutthroat trout population, they carried out a culling operation – based primarily on the number of spots on the specimens. They systematically removed trout that did not meet the spotting meristic. 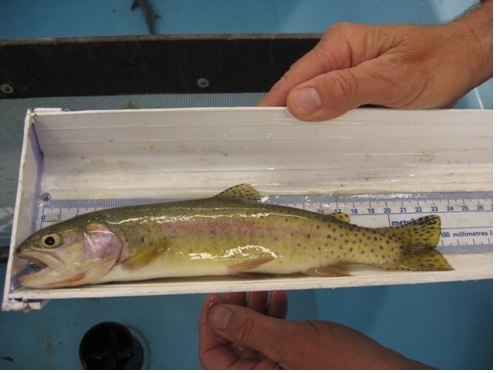 Perhaps it should have been considered that the same thing would need to be done regarding the effort to bring forth suitable representations of the Alvord cutthroat trout; because we were starting with already hybridized specimens. A necessity to cull of some of the offspring or progeny of the selected parents should not have been unexpected, but realistically should have been anticipated. Perhaps there are several lessons that can and should be derived from this experience. Several States have gone to great lengths to restore trout that were extremely imperiled; even species that were once believed to be extinct. 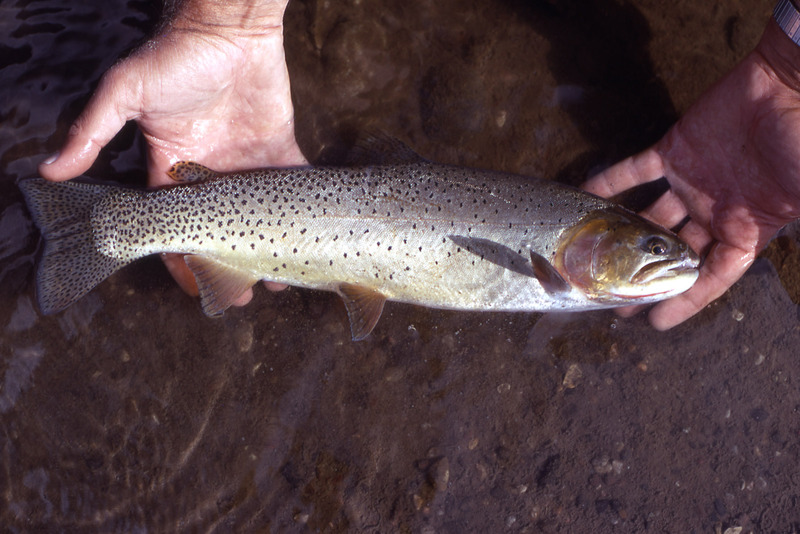 Inevitably, States identify the tourism-draw and cost-benefit that accrues through restoration of rare trout; and the inherent wildlife/wilderness reputation these States derive. 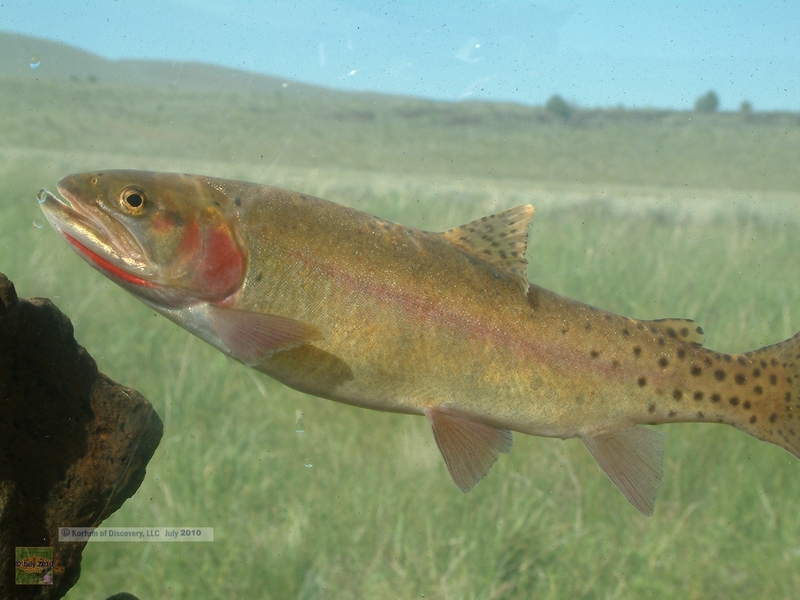 California, Colorado, Nevada, Wyoming, New Mexico & Arizona acknowledge the economic benefit accrued by the revival of rare, or once thought extinct, strains of trout — including Apache, Bonneville, Gila, Golden, Green Back, Lahontan, Paiute and Rio Grande. For these trout, the battle has been long-fought. 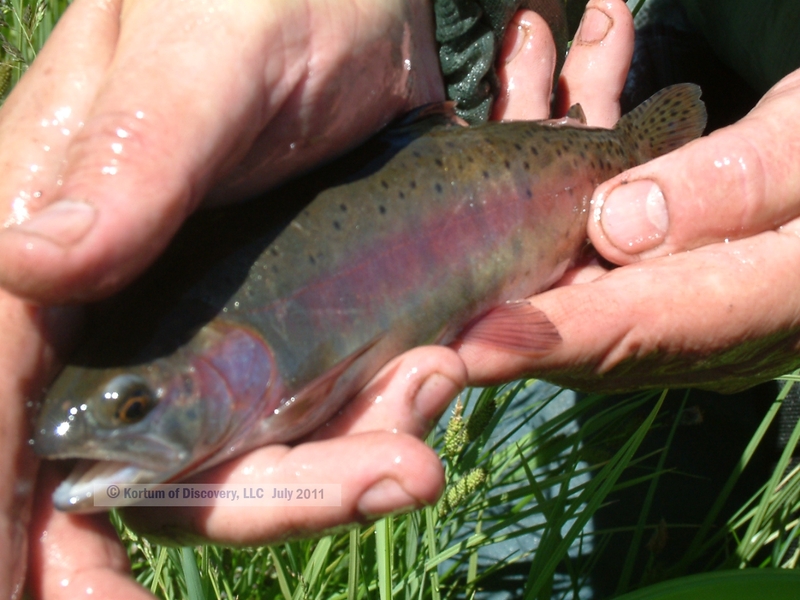 Yet the States acknowledge long-term cost-benefits outweigh the short-term cost and the effort to revive and restore these strains of trout . . . 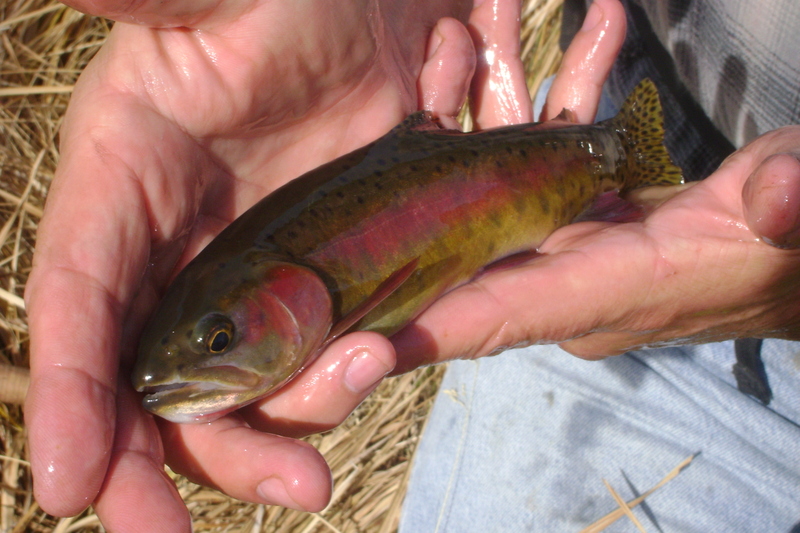 There are many more thoughts that have flowed through my mind this winter; especially since hearing that the trout were removed to the closest convenient body of water near the Fort Klamath Hatchery that was “authorized” for the release of cutthroat trout. Perhaps, to those who could not see the intrinsic value and potential of these progeny, this may have seemed to be the most humane thing that could have been done for these trout. 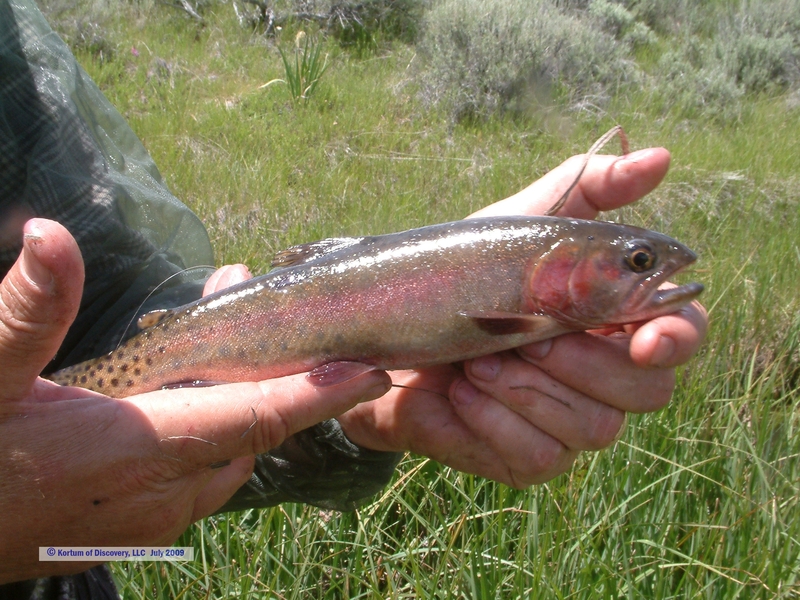 Of the potential lessons here – perhaps, for this remnant of phenotypical Alvord cutthroat trout from this isolated desert stream; the genetics for outward expression of alvordensis characteristics are recessive. — Therefore work would have to be done with subsequent generations of hybridized stock in order to achieve a “pure” self-perpetuating remnant of phenotypical alvordensis. 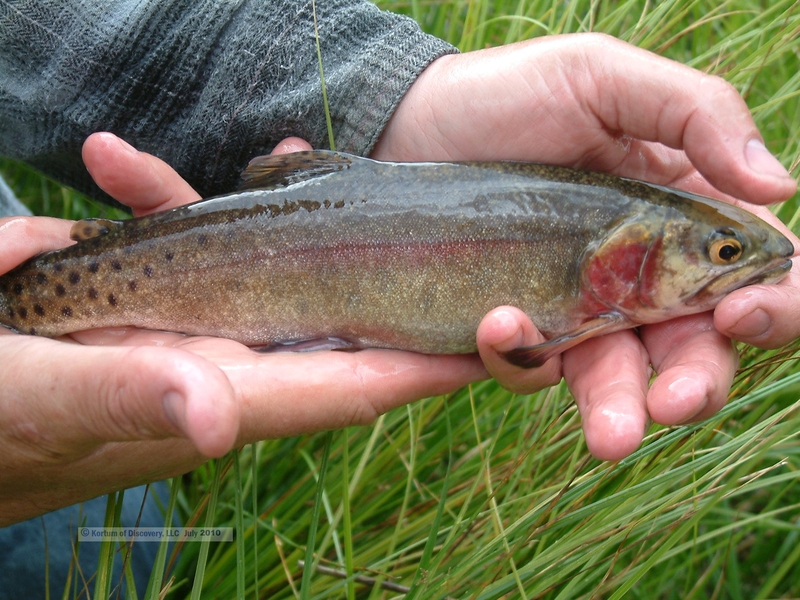 As has been the case from the beginning; will or willingness are core constituents of what is required to have any prospect of a successful restoration of phenotypical Alvord trout. Yet I would add to that – a dimension of belief and vision. Belief that there is indeed value to the natural order as it developed prior to man’s disruption. Belief that there is a value, as stewards, in doing what we can to protect or restore that natural order; and that future generations will see, appreciate & embrace the beauty & wonder of that natural design. Without that dimension of belief and vision, there is not ability to see the potential and the prospective outcome to seek; let alone the willingness & the will to do what has to be done. 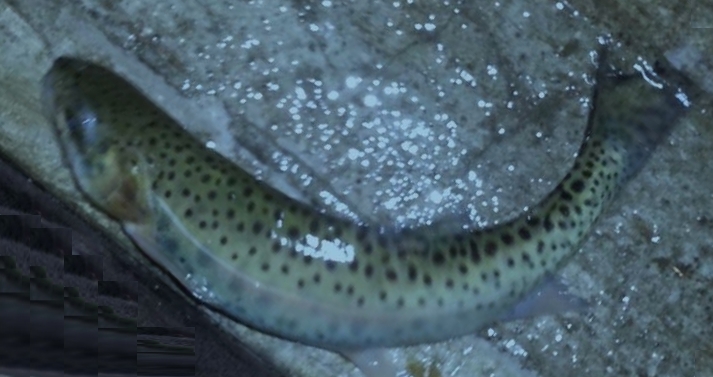 As it was, years ago, when we first embarked on this journey with a remnant of an extinct trout; there are still so many more questions than there are answers. It truly is tragic that the plan was not followed through. If at least the most optimal of the phenotypical offspring had been released into a self-sustaining system — then, only then, could we have seen what these trout would have matured into and expressed — as adults. So tragically sad. The only thing that is now certain, is that the prospect for restoring the phenotypical representations of an extinct strain of trout from this remote desert stream has become incalculably more problematic – exponentially more unlikely to be achieved. Yet there is still an unwillingness to give up on the prospect that somewhere, somehow, a population of alvordensis still survives in the remote regions of SE Oregon or NW Nevada. May we still, somehow, find a silver lining in this dark grey cloud of bitter disappointment. Let us ascertain the lessons to be learned, and any wisdom that can come from this dismal experience. Let us take those with us into whatever difficulties or challenges, probabilities and possibilities, the future may hold. And may that future be more benevolent and bright than this last chapter of disillusionment where the Alvord cutthroat trout are concerned. Kortum of Discovery (a slight play on Lewis & Clark's Corps of Discovery) is a family team that is Affirming the Exceptional Beauty of Nature, one Adventure at a Time. With a focus toward rare and endangered species in the Great Basin and American west: discoveries, unique methodologies, and many “tall tales to tell” are continually being shared around the campfire! This entry was posted in Observations, Of Fauna and Flora, Photo Journals, Progress - Reply - Response - Status. Bookmark the permalink. always produce miracles…but it is far better to live with it than without. Unbelievable: 6 years from discovery to discouragement.